This card is the second one I am going to be making with a friend this holiday season. I saw a sketch like this on a card featured in a stamp magazine a couple of years ago. I love it. The trees were embossed with white embossing powder on night of navy card stock. 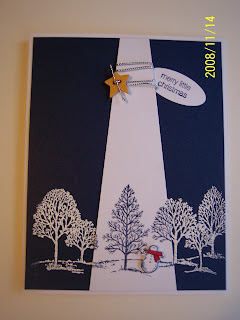 Then I stamped them on white card stock using night of navy ink, but cut out only the tree in the middle. Wrapped silver cord with star shaped button around the top of the white card stock and attached it to the embossed trees. Stamped the snowman, colored it and cut it out and attached it with dimenionals. Stickles was added to the trees and "snow" on the ground.The verse was stamped and punched out with the large oval punch by SU and tucked under teh white card stock. The card front was matted on white card stock. What a lovely effect on this card. I've cased it a bit - hope that's ok!